Which data do you need? In what format? Text or binary? Is an initialization or a synchronization needed? Refresh rate... I don't have any idea... I guess everything above 25hz would look smooth... but timing is not crucial since mcu will spend most of time only waiting for serial data. Serial port could be set at 38400. The idea is to write to serial port a 5 bytes "header" at startup, and then 1 byte for each packet, followed by data. Can Arduino read 32bits integers? Does it need little-endian or big-endian data? Wow... this looks really awesome. It's sweet that the main LED component is built ready to go. Can I get a status update? How many games do you have this working in... any luck with iRacing and/or Live For Speed? 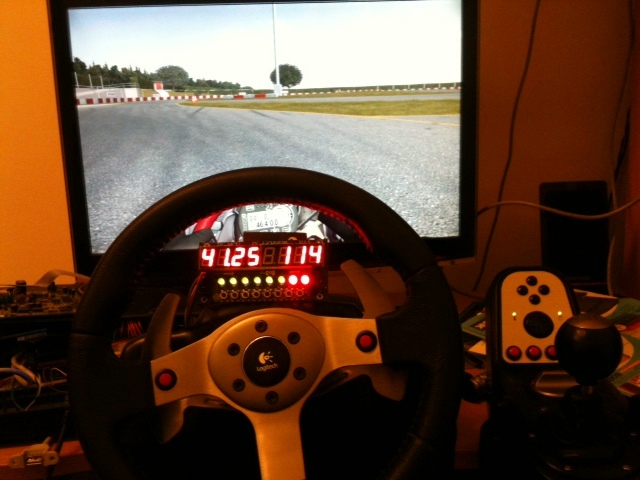 I have this working in iRacing. Here is a video. I am more than happy to share the Code and client for it to work there. Has there been any progress for it to work with KRP? I'm new here, so not sure how it all works here. Thanks, Piboso. I've never written a DLL so will have to look in to it. A user on iRacing had created one so I just used that for that sim.